The Food Alphabet and More: The Food Alphabet supports #Foodless Plate with Healthy Options! What is #Foodless Plate? It's as obvious than it is already stated. We need to finish our plates all the time, and not waste anymore food. What to do to be part of this incredible campaign. 1.) After eating your meal, post a photo of your empty plate on Instagram, Facebook or Twitter. 3.) 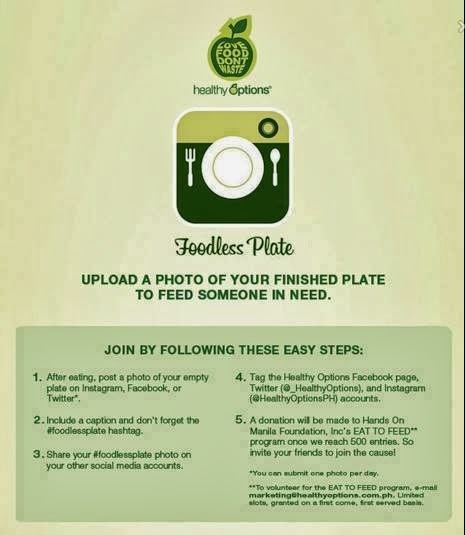 Share your #foodlessplate photo on your other social media accounts. 4.) Tag the Healthy Options Facebook Page, Twitter (@_Healthy Options) and Instagram (@HealthyOptionsPH) accounts. 5.) A donation will be made to "Hands On Manila Foundation Inc.'s EAT to FEED" So the more your post the more donation will be made to help feed the hungry. So invite your friends to join and part of this campaign.